Now, I have to continue my previous article about new Microsoft Dynamics NAV 2015 image in Gallery Image on Microsoft Azure. I said that system is configured with Windows credential type. Now, I want to describe, how you can change it very easy with prepared scripts in DEMO folder. 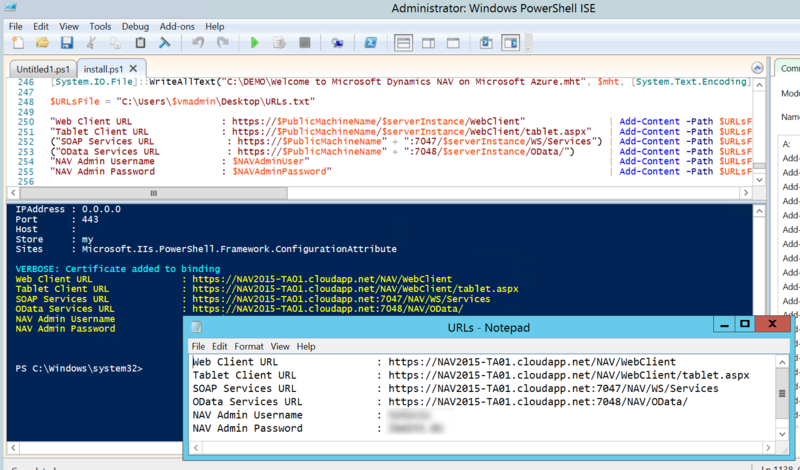 On ‘Welcome to Microsoft Dynamics NAV on Microsoft Azure’ page, you can find Initialize the Virtual Machine link and with it, you can open DEMO\Initialize folder with PowerShell scripts. System always give you possibility to choose default values or to change with your own. For Certificate Pfx File, system ask you to fill your certificate file or choose self-signed certificate. When script finish all necessary tasks, you will get as result all information (URLs and credentials). Also, you will get all shortcuts (Windows, Web and Tablet Client, Development Environment, Administration and Development Shells…) on your desktop. Thanks to Microsoft. I really like this script, because everything is so easy. I will continue with other features on this Microsoft Dynamics NAV 2015 Gallery Image in few following days. Finally, we got a new NAV release as image on Microsoft Azure Gallery. This is Microsoft Dynamics NAV 2015 CU3. I expected it earlier, because GP 2015 has already existed. But, OK this is not so late. 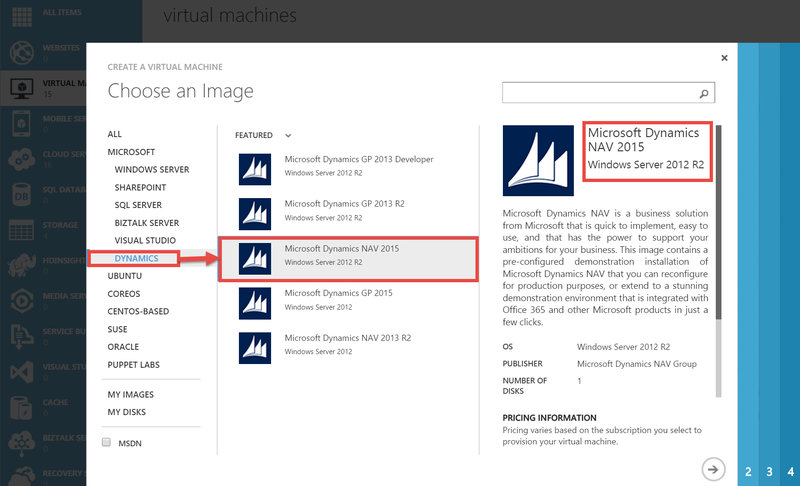 Now, all of you who want to test Microsoft Dynamics NAV 2015, can do it on Microsoft Azure VM. And, I am really happy, because it is with the last CU with great features. You can install it easy as you only need to follow instructions and wait few minutes for deploying. You can use Connect icon to make connection with new Azure VM. When you are signed on VM, you have all necessary links and you can run new NAV. You can run Windows, Web and Tablet clients or Development Environment. You also can run Administration and Development Shells. But I am little disappointed, because again as for NAV2013R2, we have configured Windows credential type, not NavUserPassword. With Windows credential type, you can use this NAV only on this VM. You cannot have really Azure experience. You also have only two endpoints, but you can add additional. To make Azure experience with logging from your computer, you have to change credential type with new tools (I will post about it). But regardless of it, it image has excellent tools. You can find all important location for NAV on VM easy and you can add your language, as well and do other great things. Some of features are not installed by default, but you can easy find installation DVD (using link on home page) and finish it if you need. You also can find a lot of cool demos. In any case, thanks to Microsoft for this image. I will have a lot of information for few days, after I make a few demos. Cumulative Update 3 for Microsoft Dynamics NAV 2015, known as Build 39368 is published in January 21. You can find CU3 on this link, but if you try to find it on the list of all cumulative updates, you cannot find it. I don’t know why, but it still missing here. On this list, you can find only CU1 and CU2. But, if you use my first link, you can find CU3 easy. As we used to, this cumulative update includes all hotfixes and regulatory features that have been released for Microsoft Dynamics NAV 2015, including hotfixes and regulatory features that were released in previous cumulative updates. You can also find local application hotfixes for AU, DE, ES, FI, FR, IT, NA, NL, NO, RU and SE, as well as regulatory features for NA, NL, DACH and ES. I expect, Microsoft will publish this formally on their blog. I hear very often that some made “almost all” by the project management methodology. They usually say, “I used maybe 99% by methodology”. But their projects still crashed. And, this is not connected with methodology type they used. You can use waterfall, agile or some mixed type, but you must really USE it in practice. First, you must know methodology you choose and then you can choose tools for your project leading. If you want successful project, you have to provide top managers support, well known methodology for using and project leadership by someone who has successfully implemented a similar project(s). But, if you think about these, you will see that all of that is actually Project Management. If you correctly lead a project, this project will be successful. On other side, you can find a lot of reasons, why projects are unsuccessful, but they are mostly unsuccessful because of project management missing (either on the side on implementer or on the client side). Sometime in very rare situation, project can crush because of inexperienced or bad developers or consultants. But, this situation is really rare, because Project Management is the main reason for both of them, SUCCESSFUL or UNSUCCESSFUL projects. You cannot use almost all from Project Management Methodology. You can USE Project Management Methodology or you can NON-USE Project Management Methodology. Because of that, I like to say that Project Management is Boolean, you can use or non-use. You cannot use 87% or 96%; you cannot measure usage of Project Management Methodology by percentage. Imagine for a moment car driving. I pass driving test, I never drink alcohol when I drive, I always drive slower than the limit, I never drive through red light, etc. But, I just keep my eyes closed while driving, but everything other is OK. I respect 99.9% of the rules. But are you want to be in car with me. Maybe I can drive a few meters, but for surely I cannot drive on this way for kilometers. The same situation is with projects. Maybe, you have to brake some rule in some specific situation, but I must know how and where to return to be on a right way again. If you don’t know it, you will never (successful) arrive to the end of project. But, this is for example one project flow in non-ideal situation, but in situation where we know where have to go. We can see that sometime we do something irregular, but if we know where we have to go back, we can finish project successful. It is not so easy, but project management is a complex job and not so easy :). But if don’t know tools, roles, risk, deliverables… we don’t know where have to go and for sure, we cannot finish project successful. Maybe we can do it, but only accidentally. And, this success is not repeatable. And you can use any type of project management methodologies. OK, for some project type is better agile, for some other project types is better waterfall and so on. But if you well know project management methodologies, you will choose a right model. But even, you make a wrong choice, you just have to respect all the rules of this methodology. If you choose what you have to use and what you have not to use, YOU DO NOT MANAGE WITH THE PROJECT. Social Media Monitoring – ability to listen to and monitor publicly available social communications across public and managed networks administered by third parties. Social Analytics – ability to identify, compute, and project queries related to publicly available documents and posts. You can find more about Microsoft Social Listening here. Vjeko has published How Do I video about this topic in CU3 here. Now, we will wait for new CU3 and hope it will be published :). In the last few years, you could find a lot of different “How Do I” videos on MSDN or Youtube. But, you always had a problem when you want to find some specific video. Now, Microsoft have arranged a part of Partner Source for these videos and not only for videos. If you are a Microsoft Dynamics NAV partner, you will easy find video you need. Video Series on Microsoft Dynamics NAV Design Patterns: This video series explains how to implement the best practices to solve problems in your vertical solutions. Video Series on Microsoft Dynamics NAV Reporting: This video series explains a lot of various topics related to NAV reporting. Video Series on Microsoft Dynamics NAV In/On/With: This video series explains all about Microsoft Dynamics NAV in Office 365, on Microsoft Azure and with Microsoft Dynamics CRM and other services, from deployment to usage. Video Series on Microsoft Dynamics NAV Integration & Extensibility: This video series introduces various topics related to NAV and integrating it with various external solutions and systems. Video Series on Microsoft Dynamics NAV PowerShell: This video series explains all about usage PowerShell tools in Microsoft Dynamics NAV. Video Series on Microsoft Dynamics NAV Tips and Tricks: This video series introduces various topics related to the NAV tips and tricks. Now, you can find all currently published videos, allocated in logical parts. In the near future, there will be a lot new videos to make cohesion between them and all of us hope that it will help to all partners.